The Chinese Garden at the Montreal Botanical Garden in Montreal, Quebec is a spectacular display of Chinese lanterns during the Magic of Lanterns Festival. 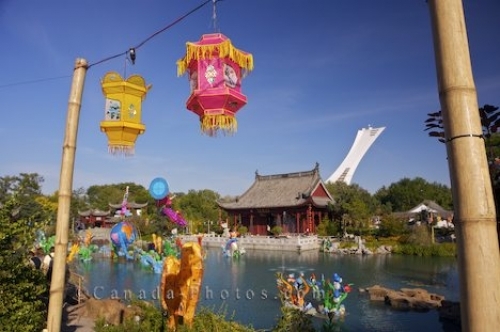 Hanging from wires, adorning the banks of the pond and floating atop the water are the beautiful created lanterns in the Chinese Garden at the Montreal Botanical Garden in Montreal, Quebec. This display is a yearly event known as the Magic of Lanterns Festival promoting the cultural and legends of Chinese traditions. Lanterns in the Chinese Garden during the Magic of Lanterns Festival at the Montreal Botanical Garden, Jardin Botanique de Montreal, Hochelaga-Maisonneuve, Montreal, Quebec, Canada. Picture of the lanterns that adorn the Chinese Garden in the Montreal Botanical Garden in Montreal, Quebec during the festival.